Riding to meet his wife on a stormy night in 1286, Alexander III of Scotland was thrown from his horse and killed. His death precipitated a struggle for the Scottish throne that would draw England and Scotland into three centuries of damaging conflict. 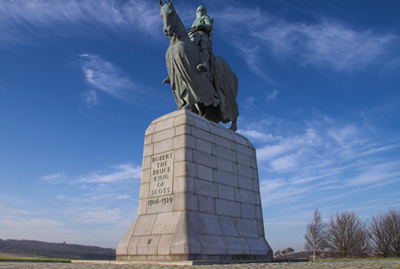 Bannockburn, fought within sight of Stirling Castle, was a major landmark in this brutal war. Its anniversary, moreover, has a particular resonance in this year of the Scottish referendum. Two chief rivals for Scotland’s crown emerged -Robert Bruce, Lord of Annandale, and John Balliol, Lord of Barnard Castle-and Edward I of England arbitrated between their claims. In 1292, he determined in favour of Balliol, who became John I, but he exacted as a price for this favour the homage of the new king. English kings had previously claimed feudal overlordship of Scotland and some-such as William the Conqueror-had even exacted it. Yet it was a contentious issue that placed the Scottish king in subservience to England. John I’s rule proved unhappy and he failed to satisfy Edward I, who made deliberately predatory demands on his vassal. Meanwhile, opposition within Scotland brought about his formal deposition by a council of Scottish nobles in 1295. Now, against the background of a Scottish civil war involving the French, Edward I invaded Scotland at the head of a great army and annexed the kingdom in a campaign of less than six months in 1296. Famously, one trophy of war was the Stone of Scone, the coronation stone of the Scottish kings, which was packed off to Westminster. English rule proved deeply unpopular and, within a year, in 1297, William Wallace led a popular rebellion against it. Edward I responded with a series of invasions that vanquished but failed to destroy his opponents. After Wallace’s defeat at Falkirk, in 1298, the Scots generally evaded English armies. Nevertheless, in 1304, Edward I appeared to conquer Scotland for a second time and imposed a fresh regime upon it. Scottish opposition now found a new figurehead in Robert Bruce, grandson of the original claimant to the throne, who was crowned king of Scotland at Scone on March 25, 1306. Bruce had supported Wallace’s rebellion, but, latterly, served Edward I. Six weeks prior to his Coronation, he also murdered his arch-rival, John ‘Red’ Comyn of Badenoch, in the Franciscan church at Dumfries, setting against him many former supporters of John I. Edward I responded with another invasion, but fell sick on his way north to lead it in 1307. His death offered Robert I both a respite and an opportunity. The reign of the new English king, Edward II , was an almost unmitigated disaster. In particular, his favouritism towards the Gascon knight, Piers Gaveston, pushed England to the brink of civil war and alienated the Earl of Lancaster, his most powerful subject. The crisis in England offered Robert I the opportunity to rebuild his political fortunes. Following the fall of Perth, Roxburgh and Edinburgh, Stirling Castle agreed to surrender if it had not been relieved by Midsummer’s Day 1314. Edward II was forced to lead an army to Scotland in what was widely viewed as a trial of strength. The English army was powerful, but its leadership was riven by internal jealousies and no less a figure than the Earl of Lancaster led the list of those who pointedly failed to join its ranks. It marched north from Berwick on June 18 and came into contact with the Scottish army just south of Stirling on June 23. There are several 14th-century accounts of the battle, but it’s difficult to piece together a narrative from their sketchy descriptions. The Scalacronica, written in 1355, states that the Constable of Stirling rode out to warn the English of the Scottish position. The vanguard of the English army, however, continued its advance and was checked in a fierce engagement. In the course of this, Robert I won a single combat with an impetuous English knight. Meanwhile, a second English force was also worsted in another assault. Robert I had intended to withdraw, but these two victories heartened the Scots. Then, a certain Sir Alexander Seton treacherously left the English army and encouraged Robert I to fight. The English were tired and disheartened, he reported. Consequently, at sunrise the next morning, the Scottish army advanced in three hedgehog formations of pikemen termed schiltroms. The English had been under arms through the night and were hemmed in on a narrow front by the surrounding, boggy landscape. Their archers failed to damage the approaching Scottish formations, which drove back the tightly packed ranks of English knights. A rout ensued and the English were forced back over the eponymous Bannock Burn at a point-the exact location remains uncertain-where it had steep banks. The loss of life was enormous. There was no contemporary doubt as to the implications of the battle. As the Lanercost Chronicle states: ‘After the aforesaid victory Robert de Brus was commonly called King of Scotland by all men because he had won Scotland by force of arms.’ Nevertheless, his victory had a serious flaw: Edward II escaped (accounts vary as to how) and refused formally to endorse this reality. As a result, the Anglo- Scottish war continued, with the Scots devastating northern England during a period of unusually poor harvests. The result was more than a decade of destruction, extortion and famine in England as far south as York. The pressure of these attacks combined with intensive diplomacy-most famously, the Declaration of Arbroath, dated April 6, 1320, a letter to the Pope asserting that Scotland’s fight was ‘not for glory, nor riches, nor honour… but for freedom-for that alone, which no honest man gives up but with life itself’-eventually brought the English to terms and, in 1328, Robert I was recognised as the king of an independent kingdom of Scotland. Yet this Scottish triumph introduced new complications. Previously, it had been possible for individuals to own land and perform feudal service in both Scotland and England. Robert I disinherited his political opposition to endow his supporters and demanded their homage in return. This gave Scotland political integrity for the first time, but it also created a formidable league of the disinherited. When Robert I died a year later, in 1329, this group turned to John I’s heir and the humiliated English for redress. And Scotland was once again engulfed by war. In this year of the referendum, the cost of Scotland’s mid-14th-century independence is sobering to contemplate.